In some respects, yndi halda only looks like a real band from the outside– releasing a record, touring, playing festivals. Internally, the band exists more like hobbyists – five young men who starting writing music together at school, and who are given occasion to share that music here and there. Of course, yndi halda loves releasing records and touring, and pours a great, great deal of themselves into their music, but it’s not a fully accurate picture of the five of them. The band doesn’t play music full-time. And for a very long period, the members didn’t live in the same city, meeting only occasionally to play shows. Sometimes they were barely able to see each other for months. But now, four (of five) of the band members live in Brighton, and thus have been able to release a new album – Under Summer – after a few years away. yndi halda has been working on this new album since their debut – they even began playing one of the new album tracks when they toured Asia and the United States in 2007 – but didn’t create the final recorded versions everyone agreed upon until much more recently. This was partially because of the expanded sound palette. Introducing vocals was a change for the band and something they wanted to get right. Likewise, the fuller, more expansive arrangements and larger-scale composition. And of course the production. The original bass player Daniel Lovegrove recorded the debut LP Enjoy Eternal Bliss in a friend’s barn on a mobile setup in a few days. Under Summer took yndi halda, over some months, to three different studios with three high-grade producers and even incorporated some home recording. yndi spent a great deal of time and energy recording the album during the periods that they could, during the times that everyone could afford away from our own lives and responsibilities, numerous and demanding. And yndi halda is incredibly excited to start this next step. To share with people that music that has lived with them for years, that has been argued over and sweated for, recorded and un-recorded and re-recorded, abandoned, and then rescued. 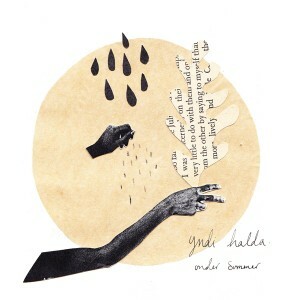 yndi halda called the album Under Summer. It is two references, for them at least – inevitably it will mean something different to everyone who hears the album. But for the band, it is the very upper limit of the sky under which they wrote and recorded the album. The endless July days that they played into, a perfect calm, and joy. But it’s also a sadness. ‘Under’ as in ‘beneath’; sorrow and heartache. yndi finds this important because they want to express that in their music too – sadness and bliss; what one means to the other. That sentiment was a driving force. Not only in the composition, but in recording and finishing the album. The musical silence between the records was characterized by (and makes up part of) that sadness and bliss too. yndi halda also listened to lots of music — far too many bands and records to name – and watched endless films and read endless books, wrote endless academic papers through their respective universities, wrote solo albums, published fiction, underwent great personal changes, and moved cities and countries. They lost a bass player (Brendan was offered the Sam Smith touring band gig and he took it) and replaced him with their very close friend (and incredible talent) Alex Petersen, with whom they had played with in other bands for years. All of that became part of Under Summer, its composition and its expression. It’s a very personal album (hence singing) and while it means something very different to every member of yndi halda, it means a huge amount to all of them. Something far larger than written words in a press release, but something yndi halda hopes is present and perceptible in the record. yndi halda formed as teenagers and released their debut record Enjoy Eternal Bliss in 2006 through Big Scary Monsters (UK / Europe), Burnt Toast Vinyl (USA), and XTAL Records (Japan). Their music is at once subtle and joyous, hitting huge emotional peaks around moments of serene gentleness and heartbreaking sadness in its orchestration of sonorous guitar interlacing, meticulously crafted string arrangements and – now – soaring vocal harmonies. Described as “epic beauty” by Drowned in Sound and “electrifying” by The Line of Best Fit, Enjoy Eternal Bliss picked up accolades worldwide, leading the band to tours across the UK, Europe, USA, and Asia, including shows at London’s famed Barbican Hall, Koko and Union Chapel venues, and entirely selling out a short residency at Hoxton Hall.